Solar energy efficiency can help keep your home warm with little or no costs or energy losses each month. A solar energy heating system can help you save money and protect the environment both. Installing a solar energy heating system can be convenient, and tax incentives may cover part or all of the costs. Solar energy heating systems will be one of the dominant heating forms in the US, and possibly around the globe, not too far in the future. These systems offer many benefits, and they are very energy efficient while keeping your home heated to a comfortable temperature. There are five main reasons why solar energy heating will be the biggest heating source in the future. Solar energy has the benefit of being a renewable alternative source of energy, and this means that there will never be a problem with a shortage. Sunlight occurs naturally, without any effort on our part. This means that once the collection equipment is set up to collect and store solar energy to heat your home, the sunlight will do the rest with no effort on your part. Solar energy will never run out, unlike fossil fuels which are growing more scarce every year. The use of solar energy heating systems will lead to the elimination of fossil fuels before they run out, averting a global energy crisis which could become severe. Solar energy heating systems are one of the most environmentally friendly alternative sources of energy and heat available. These systems have no harmful carbon emissions which contribute to the increase in global warming, and there is also no particulates or other pollution released into the air which can cause smog and other harmful effects. Fossil fuels are based on carbons, so it is no surprise that these same fuels are responsible for most of the air pollution in cities and the global warming effects becoming worse. Solar power is much cleaner, and will help protect the environment instead of helping to destroy it like many other energy sources. 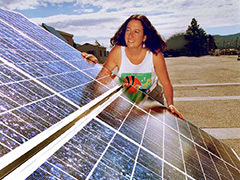 There is no damage to the earth or environment in the recovery of solar energy and heat. The federal government, and many state governments as well, offer tax incentives for installing a solar energy heating system or other alternative energy system in your home. These tax incentives can be substantial, and may pay for most if not all of the initial costs of the solar system you install. This means that you may get tax breaks in the amount of the cost for your solar system, and in addition you still get all the other benefits these energy systems can offer. Posted on April 10th under Renewable Solar Power. I enjoy your post – nice work! Thanks for the post, good stuff!